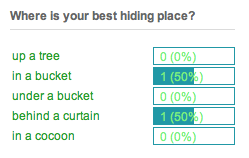 mmm... looks like most people are keeping their hiding places a secret. next poll coming soon. (Percy). I wouldn't mind if Munch found me up a tree. But my winter hiding place is a secret.